Wiley Walker was born on 17 November, 1911, in Laurel Hill, Florida. Having learned to play the fiddle as a child, he started touring tent shows as a teenager. In 1937 he found himself in Shreveport and there he met Gene Sullivan. Gene Sullivan was born on 16 November, 1914, in Carbon Hill, Alabama. Having started out as a professional boxer, he turned to country music in 1932. Together with Walker, he played with the Shelton Brothers in the mid 1930s until they formed their own duo in 1939. 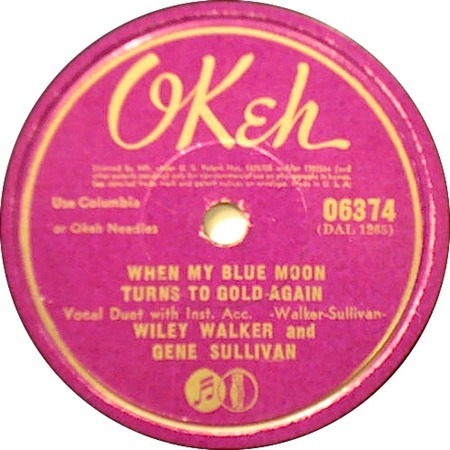 They recorded their original version of "When My Blue Moon Turns To Gold Again," which they also wrote, on 9 March, 1941. It was released as a single on Okeh 06374 that same year (and later re-released on the Columbia label). Wiley Walker died on 17 May, 1966. Gene Sullivan died on 24 October, 1984. Elvis cuts this number considerably by omitting two verses. The original version was not a success, but in 1944 Cindy Walker reached number 5 in the national charts.